So, remember those tart shells I forgot to take with me to the store last week? Well, here they are today. As you can see, I managed to remember them this week and only barely! I’m ashamed to say that I had to write a note and place it in the fridge to remind me. I usually grab all my refrigerated ingredients as I’m walking out so I knew if I left a piece of paper that read “tarts” stuck to the heavy cream carton, I’d remember! It’s a sad day when you have to stick Post Its, everywhere. 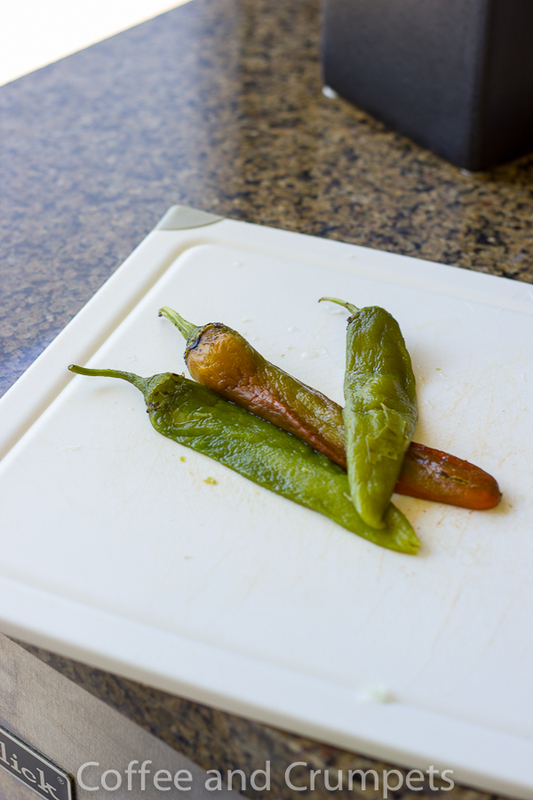 A couple of months ago, the nice folks at The Hatch Chile Store offered to send me some of their New Mexico roasted chiles. How could I say no? Here I am expecting a little box of a sample and what arrives is this huge styrofoam box with ice packs and 4 pounds of gorgeous frozen chiles. I haven’t had any time to break into them until this past weekend. I defrosted a handful to make these tarts. These chiles were hot, which is why I decided to pair them with zucchini. Zucchini is pretty easy going, non obtrusive kind of vegetable. It sits there quietly and allows others to take centre stage which is exactly what I wanted. I needed the zucchini to tame the heat a bit but still allow the Hatch chiles to shine through. The trick worked perfectly. I also added a light custard base, also to tame the heat, and it offered a nice moistness to the overall tart. I won’t lie, these tarts have a kick, but a pleasant one. The flavour of the smoky chiles shines through and the tart is so delicious. I put these out as samples and the tart was gone quickly and everyone managed the heat just fine. You could always use mild chiles if you cannot tolerate any heat. Since the pastry was made for the ricotta tomato tart, I had added some fresh thyme and some Parmesan cheese, but that didn’t interfere with the chile flavour. You can add the herbs and cheese to the pastry or just use a plain butter pastry. Hope you can your hands on some chiles to try these seasonal treat or get online and order some from The Hatch Chile Store. They come conveniently roasted and peeled and all you have to do is chop and create. 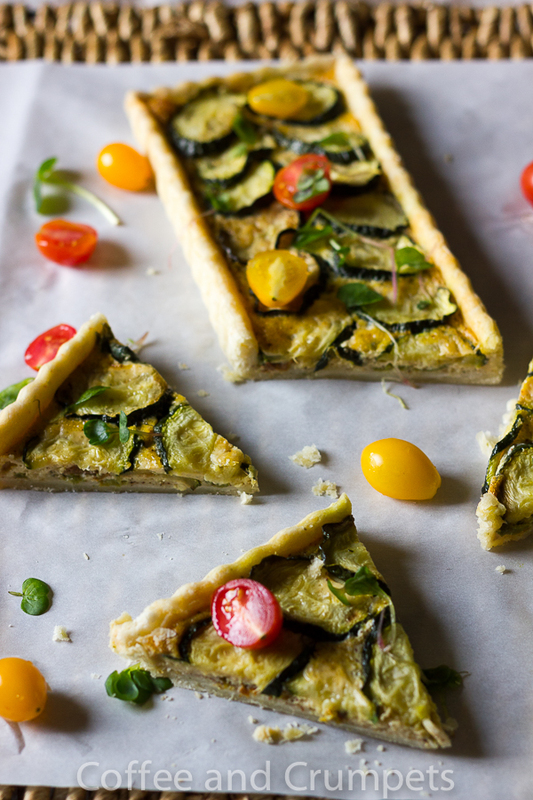 A great way to use the seasonal Hatch chiles in a tart with zucchini slices and a light custard base. In the bowl of a food processor add flour, thyme leaves, if using, parmesan cheese, if using and salt. Pulse to mix. Add the cubed butter and pulse until the mixture resembles coarse meal. Add 3 tablespoons ice cold water and pulse until incorporated. Dump out into a board or counter and knead gently till the dough holds together. Wrap with plastic and chill for 30 minutes before rolling out. The dough is pretty easy to roll out on a counter top with a good dusting of flour. You can also choose to roll it out between parchment or plastic. Roll out the dough to 18" by 8" (45 x 20 cm) for a rectangular pan or 12"(30cm) for a 9" round tart pan. Chill in freezer for 10 minutes if baking right away or overnight for later use. NOTE: The pastry is enough for one rectangular tart but the filling is for two tarts. You will need to make two of these tart shells for the amount of filling listed, or you can make 1 9" round tart. I made a double order of the pastry and made two rectangular tarts, with enough pastry scraps left over to line 6 4" tartlet tins. In a medium bowl, beat the eggs and cream together. Add the chilli powder, if using, minced garlic and salt and pepper. In about 3 tablespoons of olive oil, fry the zucchini slices till they are lightly browned. You may need to add more oil as you fry in batches. Pull them out and as they are browned and keep them on plate till all are fried. 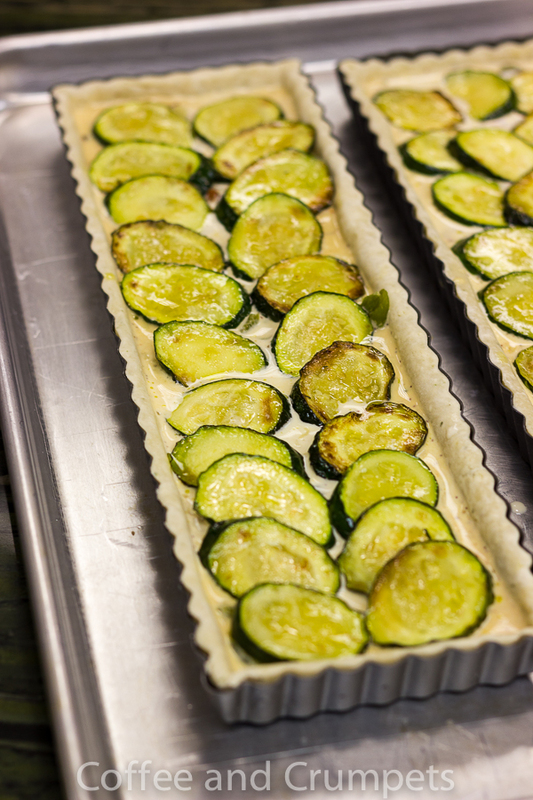 Once the zucchini are done, it is time to assemble the tarts. 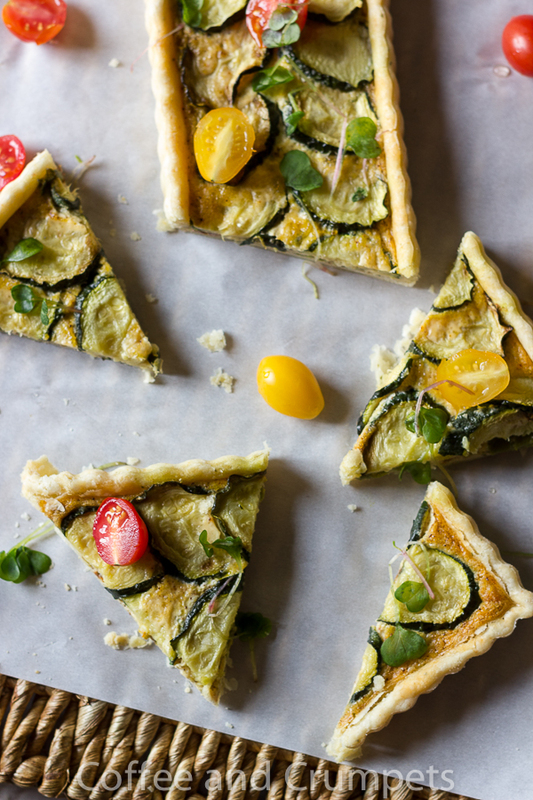 Pull the tart shells out of the freezer and place on a baking sheet. Lay equal amounts of the chopped chiles in each tart shell or if you are using a 9" tart shell, just spread out evenly at the bottom. Add the cheese if you are using, spreading it out evenly. Pour over the custard base carefully, dividing equally between the two rectangular pans or pour it all in a 9" pan. Lay the fried zucchini slices over the custard, laying them slightly overlapped in a decorative pattern if desired. Place the baking sheets with the tarts on the bottom rack of the oven. Bake for about 30-40 minutes until the top is browned and puffy and the filling is set. Let cool in the pans on a rack for about 15 minutes before removing the tart pans. To remove the bottom, you will have to let it cool and set, otherwise it will fall part. The tart is great warm and at room temperature. Remember to double the pastry recipe to get two tart shells for the filling, if using the rectangular pans! Hope you’ve all had great start to the week. Last week went by in a blur but the best part by far was hearing from all my wonderful friends again. You realise how much you miss it and them when you come back to such heartfelt comments. Thank you, my friends. 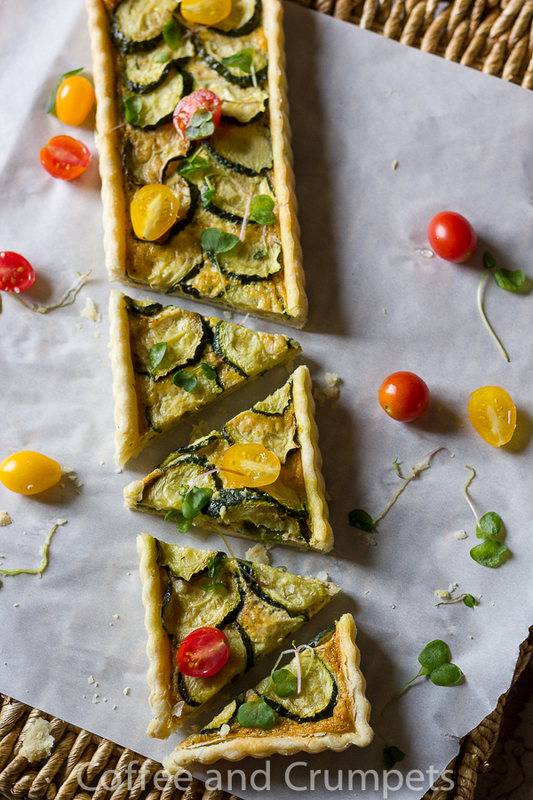 This has to be the prettiest summer tart, ever! I’ve never tried hatch chilies before! 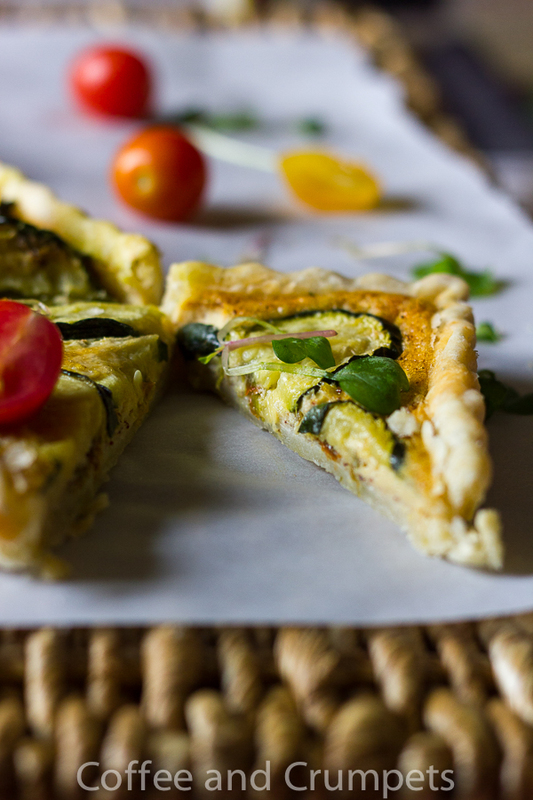 Your tart sounds so delicious, and the combination of flavors sounds phenomenal! Any idea of what you’re going to do with the remaining chillies? Your tart is gorgeous and I’m sure tastes as wonderful as it looks. I’ve never seen any hatch chilies in the markets here in New Hampshire but I’ve certainly heard about them from everyone living out west. Nazneen – these photos are gorgeous – I am sitting her drooling! Your tarts are so well balanced – so well thought out! Wow… This is literally a show stopper, Nazneen!!! It is seasonal and perfect for entertaining and also for a casual dinner. Since the last 4 years I am sticking post-it-s everywhere. Since the last two years, they get moved around by the boys… which defeats the purpose. 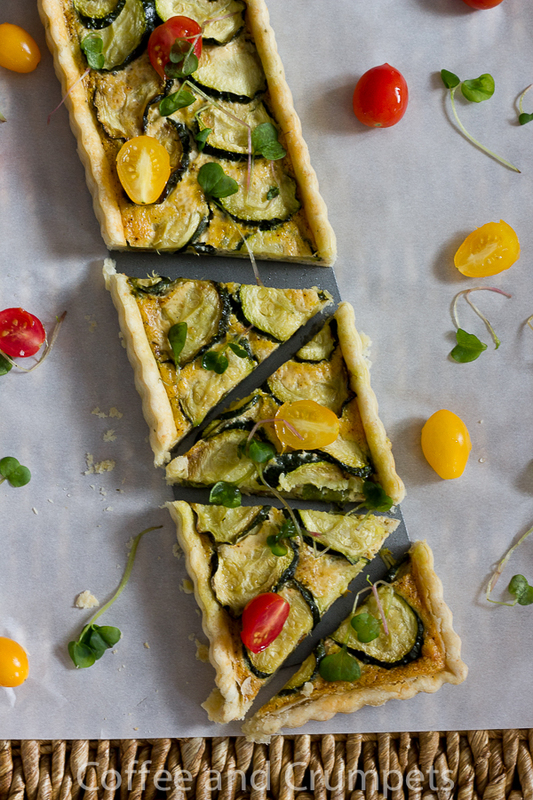 This is a beautiful tart with so much flavour. I love adding thyme my pastry too. Glad to see that you have kept up the blogging momentum. This looks gorgeous! I love the pairing of chilli and zucchini and the rectangular form is just beautiful. Trust you to turn a tart into a work of art. Looks gorgeous with a Huge G.
Now a days even post its don’t cut it for me. I forget to look at them. Duh! my asian licking would love any spicy savoury food!!! gosh, your photography skills is stunning!!! The tart sounds fabulous, Nazneen. The heat from the chile must be divine for the tart.